This book is a companion to Edward T. Martin’s first book, KING OF TRAVELERS: JESUS’ LOST YEARS IN INDIA. However, it stands alone as a description of the extraordinary journey to India in 2005 for further research on the question of those lost years. The journey across 4000 miles of India, from Kashmir to the north as well as Dharamshala and Darjeeling, and also the Meenakshi Hindu Temple in Madurai to the south and Chennai to the east (where Saint Thomas preached for about 20 years after the crucifixion), was truly extraordinary. 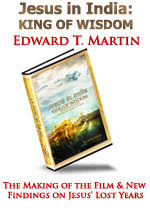 Aboard were Edward T. Martin and the film crew that embarked on making Paul Davids’ film, JESUS IN INDIA, the most comprehensive feature documentary on this subject ever made. It has been contracted for broadcast by the Sundance Channel and networks around the world by NBC Universal Television and is available on DVD with bonus features. One of the most remarkable parts of this research was the visit to Jagannath Temple in Puri, India, where a Hindu temple has existed at the site for 2,500 years. There an extraordinary and historic interview with the Shankaracharya unfolded. Shankaracharya Nischalananda Saraswati is the spiritual leaders of millions of Hindus, and he insists that Jesus was in India at the ancient temple of Jagannath as well as in Kashmir. He states that the facts about this have been concealed or covered up and denied by Christianity, and that Jesus learned from Hindus the Achar Samhita – their Code of conduct. This included Hindu teachings of Truthfulness, Mercy, Charity, Serving Others, Compassion and Ethics. The stories that Jesus also visited Kashmir imply that he not only was in India during the so-called “Lost Years” from ages 12 to 30 (after which time he would have returned to the Holy Land to begin his ministry), but that he survived the crucifixion and after a few years returned to India, where he died in old age and is buried at the Rozabal (the Prophet’s Tomb) in Kashmir, which has seemingly ancient carvings of the prophet’s feet showing the crucifixion wounds.